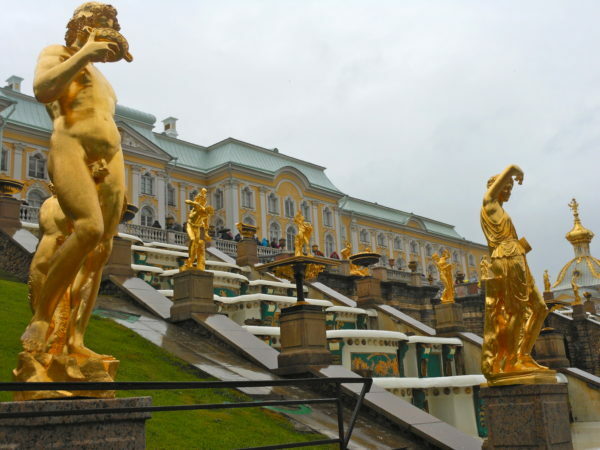 Atop the bluff, near the middle of the Lower Gardens, stands the Grand Palace (Bolshoi Dvorets). 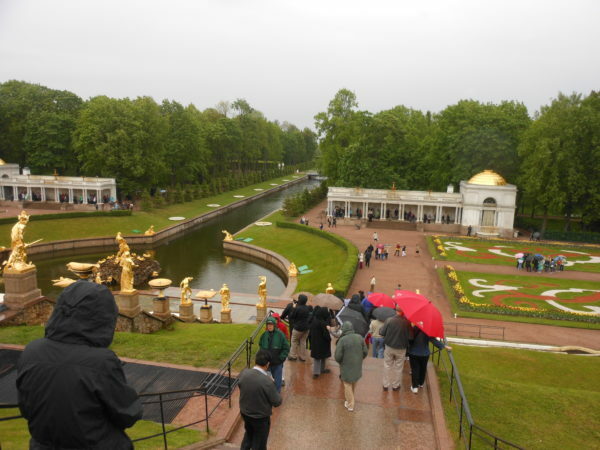 Behind (south) of it are the comparatively small Upper Gardens (Verhnyy Sad). Upon the bluff’s face below the Palace is the Grand Cascade (Bolshoi Kaskad). 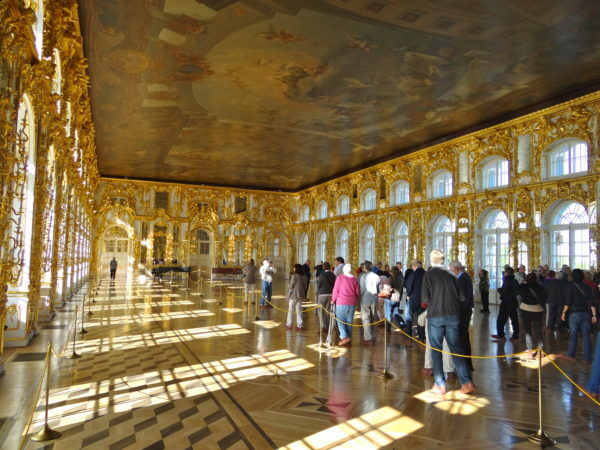 This and the Grand Palace are the centrepiece of the entire complex. 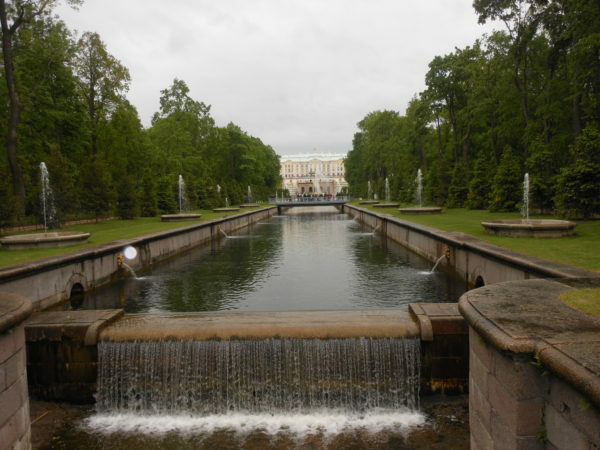 At its foot begins the Sea Channel (Morskoi Kanal), one of the most extensive waterworks of the Baroque period, which bisects the Lower Gardens. A portion of the Grand Cascade Samson and the Lion, by Mikhail Kozlovsky. The Grand Cascade is modelled on one constructed for Louis XIV at his Château de Marly, which is likewise memorialised in one of the park’s outbuildings.At the centre of the cascade is an artificial grotto with two stories, faced inside and out with hewn brown stone. It currently contains a modest museum of the fountains’ history. One of the exhibits is a table carrying a bowl of (artificial) fruit, a replica of a similar table built under Peter’s direction. The table is rigged with jets of water that soak visitors when they reach for the fruit, a feature from Mannerist gardens that remained popular in Germany. The grotto is connected to the palace above and behind by a hidden corridor.The fountains of the Grand Cascade are located below the grotto and on either side of it. Their waters flow into a semicircular pool, the terminus of the fountain-lined Sea Channel. In the 1730s, the large Samson Fountain was placed in this pool. It depicts the moment when Samson tears open the jaws of a lion, representing Russia’s victory over Sweden in the Great Northern War, and is doubly symbolic. The lion is an element of the Swedish coat of arms, and one of the great victories of the war was won on St Samson’s Day. 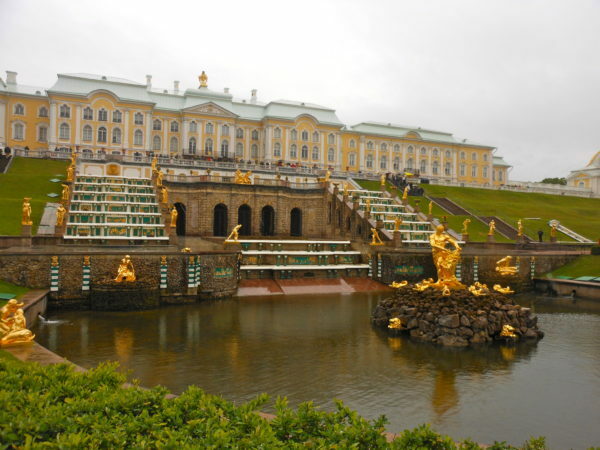 From the lion’s mouth shoots a 20-metre-high vertical jet of water, the highest in all of Peterhof. 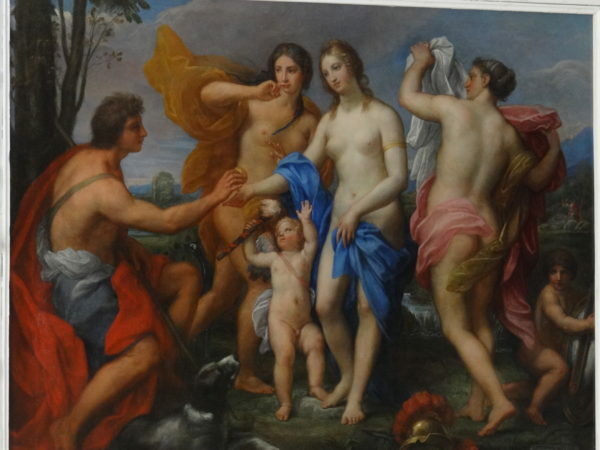 This masterpiece by Mikhail Kozlovsky was looted by the invading Germans during the Second World War; see History below. 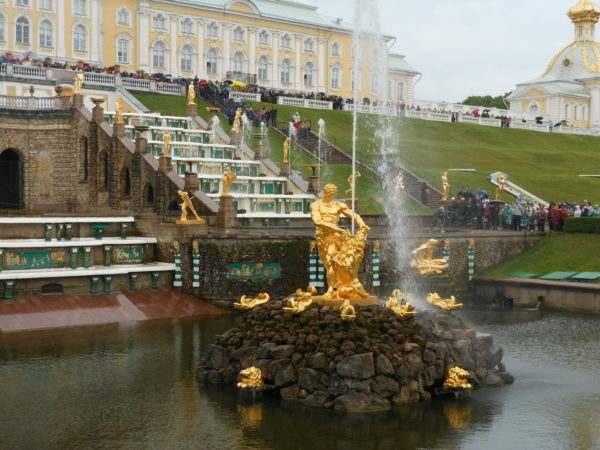 A replica of the statue was installed in 1947.Perhaps the greatest technological achievement of Peterhof is that all of the fountains operate without the use of pumps. 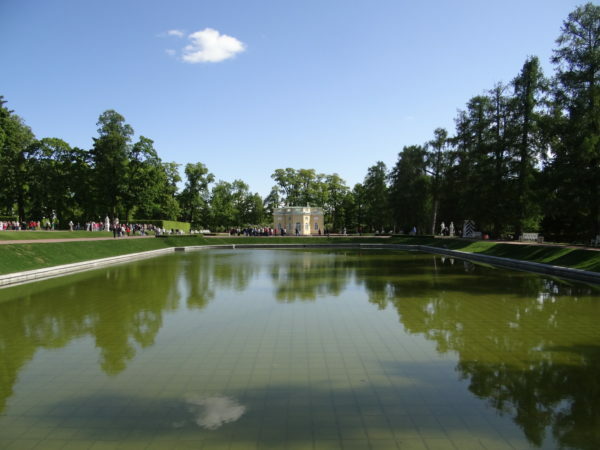 Water is supplied from natural springs and collects in reservoirs in the Upper Gardens. The elevation difference creates the pressure that drives most of the fountains of the Lower Gardens, including the Grand Cascade. The Samson Fountain is supplied by a special aqueduct, over four km in length, drawing water and pressure from a high-elevation source.The Lower GardensThe expanse of the Lower Gardens is designed in the formal style of french formal gardens of the 17th century. Although many trees are overgrown, in the recent years the formal clipping along the many allees has resumed in order to restore the original appearance of the garden. 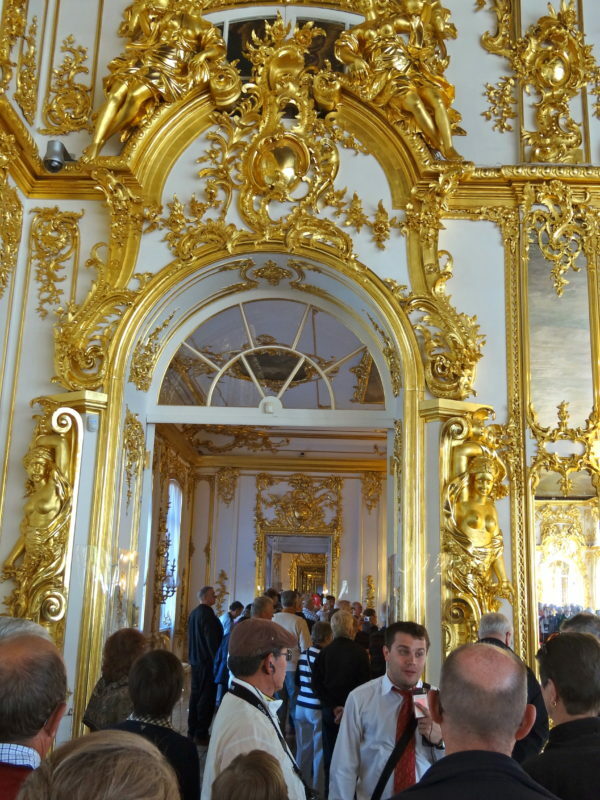 The largest of Peterhof’s palaces looks truly imposing when seen from the Lower or Upper Gardens, but in fact it is quite narrow and not overly large. Of its approximately thirty rooms, several deserve mention. 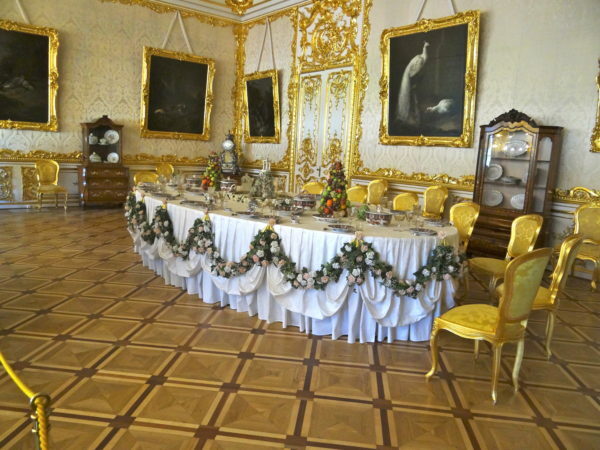 The Chesma Hall is decorated with twelve large paintings of the Battle of Chesma, a stunning naval victory of the Russo-Turkish War, 1768-1774. These were painted between 1771 and 1773 by the German artist Jacob Philipp Hackert. His first renderings of the great battle scenes were criticised by witnesses as not showing realistically the effect of exploding ships — the flying timbers, great flames, smoke, and fireballs.Catherine II assisted the artist by exploding a frigate in the harbour of Livorno, Italy, for the benefit of Hackert, who had never seen a naval battle first-hand. Hackert also did not research the actual positions of the Russian and Turkish forces during the battle, so the scenes depicted are somewhat fanciful, but do effectively convey drama and destruction of naval warfare.The East and West Chinese Cabinets were decorated between 1766 and 1769 to exhibit objects of decorative art imported from the East.